Jen is giving away a goody basket full of all writer-essential material (read: office supplies and chocolate). All you have to do is hop on over and leave a comment to be entered. Anyone heard of RT and Dorchester's American Title contest? Well, once upon I met this sweet and generous writer in an online critique group. For the past year she has been involved in this American Idol-styled contest. I just found out that she won!!! Congratulations Marie-Claude Bourque! The prize is a contract. Her book, Ancient Whispers, will be coming out February 2010. You can find Marie-Claude hanging out all over the web. She has a grog with some other great writers, a blog, and tons of other stuff. I hope you all enter Jen's contest and find hope in Marie-Claude's success! I'll bet some of you are familiar with Jennifer Shirk, Samhain author and fellow blogger. 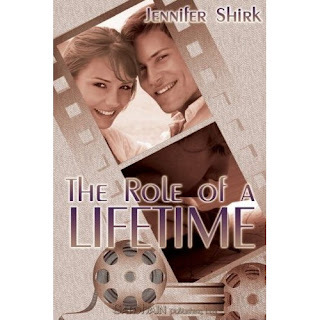 Recently I won her book The Role of a Lifetime. I have to give it away because it was SO good! Seriously, I was laughing while I read it at the gym. People probably thought I was weird. The story hooked me in and I read it in like three days, which is good with my as-of-late crazy schedule. Jennifer has a really strong, perky voice. I loved the humor and the characters. Go Jennifer! From the very beginning, I have wanted House and Cameron to hook up. I know the age difference is weird, but I always felt they had a special understanding, a trust, and an onscreen chemistry that would enable them to have their Happily Ever After. Chase didn't fit. Not the weak, ambitious Chase of the first three seasons. And now Chase and Cameron are getting married? I've watched the first three seasons more than once. I don't believe for a moment that these two will work. Even though they have friendship and attraction, they don't seem to fit to me. Who are your favorite couples in a book? What is it about their relationship that allows you to believe in their HEA? I'm so excited! My word counter finally says fifty percent done. Whew. I feel like I've made progress. I'm finally halfway through. I think the middle of a book is so important. This is where the tension is upped, where some threads are added to, others are resolved and the main one is complicated even more. Sometimes, this is where the sagging middle comes into play. The midpoint of a story is a good place to look at everything happening and take stock. Is the conflict getting higher and higher? Are the characters different than at the beginning of the story? At a different place, in the process of changing? This is how I look at the middle. What does the mid-point mean to you? What usually happens in the middle of a good book or movie? Author Intrusion. Just a nice way of saying that the writer is butting into the character's story. Characters need to have their separate worlds, their separate thoughts. They don't have to value the same things you do. They don't have to fear the same things you do. But that's not the whole gist of author intrusion. It's also when the heroine's car breaks down and she knows the radiator broke. But she's a loner librarian who usually rides her bike to work. How does she know it's the radiator? In some ways, I think author intrusion is like an omniscient POV. The creator's POV. Have you heard of this? How would you describe it? Better yet, have you ever been an intruder? Last night I watched my favorite show, House. And about had a stroke. The writers killed off a major character in a way that made no sense. I've read the interviews and I understand that they took artistic license by not foreshadowing this event. They were doing what they felt was best for the story and most challenging for the character of House. I can understand this. But what they did was very risky because it had the potential to alienate the audience. This is where the art of foreshadowing comes in. Done right, this technique won't five away the future of the story, but when a twist comes, it will give the past scenes sense and will keep the twist from completely shocking the reader. I really wish the writers would have foreshadowed this death, even if only to the audience. Do you use foreshadowing? Or do you prefer to shock your reader? Lately, there's been this suspicion that my writing is not where it should be. I read my words and wonder: Am I overwriting? Do I really need to say what the hero smells like? Do I need to describe the feelings that are overwhelming the heroine? Is it necessary to use metaphors? No one has said I overwrite. So why is my writer's conscious bugging me about it? I'm chalking it up to paranoia. Do you ever obsess over something in your writing, despite the lack of a solid foundation (crits) for your worry? Did you know each scene should advance your plot? I recently read a new author, Randy Singer, and was completely hooked into his story. It wasn't until I was halfway through that I realized I should study his writing to see why it worked so well. It didn't take me long to see that each of his scenes had more than one purpose. 3. Each scene upped the stakes so that I wondered how the characters could possibly survive with the choices they were making. I'm sure his scenes had even more literary tidbits, but these stood out to me. The important thing to know is that this was a seamless process. The scenes didn't jump out at me and scream, "This is my purpose". Rather, later scenes revealed the purpose of earlier scenes. Once again, the holidays are over. Last week I wrote less than two thousand words in my WIP. Very sad. This week things are going to be different. Now that Easter has passed (and it's spring break for some) what are your plans? Do you think you'll be able to zip along with your writing? I've tried and tried to post this video on my blog, but am completely technically deficient. Therefore, I hope you'll check it out by clicking HERE. It hurts because I've been working out at the gym. I just started last week and I'm probably not as sore as I should be, but there is a twinge here and there, just enough to tell me something is getting exercise. Do I like to work out? NO WAY! But I do it because I want the end product: toned muscles and a strong inside (you know, whatever is supposed to get better because I'm exercising, lol). I read many, many blogs. Especially yours. One thing we all have in common is our frustration with fitting writing into our busy schedules. The thing is, if we want the end product, if we want to finish a manuscript and pursue publication, then we need to force ourselves to write. I'm sure many of you, like me, are trying to make your manuscripst as perfect as possible before submitting anywhere. Take a deep breath. Your perfect manuscript will be changed. That's right. Most agents suggest revisions and so do most editors. The story you love? The one you've sweated over, tweaked, edited line by line? It will CHANGE. Why? Because there's no such thing as perfect. Jen posted a link the other day. Check out this guy's revisions. Strangely enough, this bit of news relieves me. How about you? To my four year old, it's all very straightforward. There are good guys and there are bad guys. No in-betweens. Unfortunately, life is not always so clearcut and neither should be our fictional worlds. The important thing is to make our characters believable. I just watched an old VanDamme movie in which the protag's closest family are mafia leaders. They're portrayed as good, if not a bit dangerous, for the first parts of the movie. But there comes a time when information is needed from a "bad" guy and these leaders get the info by interrogating the dirty cop. They yell, cuss and then (brace yourself) use a power tool to torture the man and eventually kill him. (My husband, btw, totally made fun of me at that scene. Apparently I was wearing a very scared face). As all good stories give the protagonist an external goal, so must he/she also have external conflicts. The external conflict is the force or the situation that tries to keep the protag from reaching his/her desired goal. There can more than one. In fact, the presence of many can make the story more riveting and can cause the reader to wonder how the protagonist will ever survive. The strength of the the external conflict may depend on the genre you're writing. I would think in a thriller that the conflict and goal would loom throughout the entire story, whereas in a romance it might be overshadowed by the internal conflict. Ironically, the external conflict for your protagonist might be the antagonist's external goal. Or in a romance, what the hero wants is what the heroine is fighting against. The old dog who didn't want to "follow" anyone because she was too lazy to figure out how. I've changed my tune now, and boy is it sweet! Instead of clicking on each of your smiling faces everyday to see what's up with you, I get your posts on my dashboard. How cool is that? Of course, you already know about this cool trick, don't you? Is there anything else this tech-retarded girl should know?